The species is widespread in Britain as far north as central Scotland, but scattered in the west and north. It is widespread in western and central Europe. The species is found on bushes and trees, often evergreen, in damp or shady situations, preferring dark damp woodland with a good shrub layer (Crocker & Daws 1996). 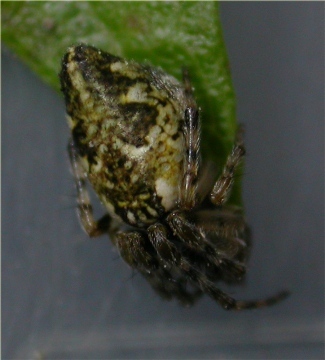 The medium-sized orb web has an extra line of silk across it (the stabilimentum); the spider sits in the centre of the web with legs folded, resembling discarded food. Adults of both sexes are found mainly in early summer, females occasionally into late summer and autumn.